Jihad Shukri Rashid Department of Persian Language, Faculty of Languages, University of Salahaddin, Kurdistan Region - Iraq. In the retelling of the story (Mem u Zin) "Mems" characterization is the result of careful and artistic depiction of Khani. The poet's detailed description of "Mems" character has amazed many addressees and researchers in a way that psychologists will do an in-depth research into this characterization according to examples from Abraham Mazlos Humanistic Model wherein human self-actualization is described. In this research "Mems" character in Khani's story depiction with Mazlo's components of self-actualization have been compared. This research shows that Ahmadi Khani has had a larger aim when carefully depiction Mems character and behavior. In this research by using humanistic model ideas, Abraham Mazlo can clearly state and portray "Mems" actions and behavior and investigate into "Mems" character. 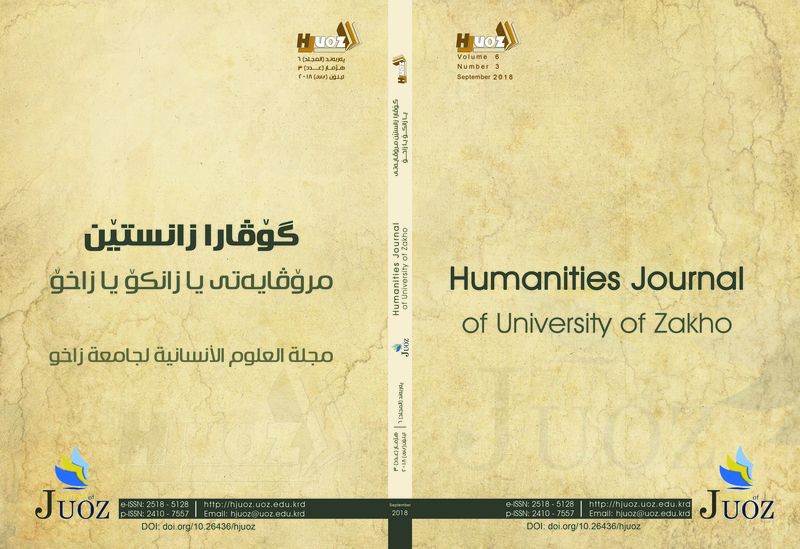 However Mazlos clarification and description of self-actualization with all the attributes of the hero of the story is not coherent but is coherent with all the specialties' that Mazlo has taken into consideration which will be described to the readers in this research. پالمر، مایکل(1385). فروید، یونگ و دین، ترجمة محمد دهگانپور و غلامرضا محمدی، تهران: رشد. شولتر، دوان و سیدنی آلن شولتز (1385). نظریه¬های شخصیت، ترجمة یحیی سید محمدی، تهران: ویرایش. شولتس، دوآن(1369). روان شناسی کمال، ترجمة گیتی خوشدل، تهران: نشر نو. کمپبل، جوزف.(1377). قدرت اسطوره، گفتگو با بیل مویرز. ترجمه عباس مخبر. تهران: نشر مرکز. Maslow, Abraham H. (1968). Toward a Paychology of Bing, New York, Van Nostrand Reinhold company Inc.
Maslow, Abraham H. (1954). Motivation and Personality, Harper & Row Publishers.